While a threat as old as human civilization, the use of terrorism as an instrument to change international policy ebbed and flowed throughout the Cold War. The Soviet Union and its Warsaw Pact allies were known to train terrorist organizations within their borders, including radical elements of the Palestinian Liberation Organization (PLO). In many ways, the PLO provided the archetype for a terrorist organization throughout the Cold War. With its anti-Western, anti-Israel ideology, it became a cause celebre for those asserting that the West was on a neo-imperialist crusade in the third world. Palestinian terrorists hijacked planes, attacked the Achille Lauro, and perhaps most infamously murdered 11 Israeli athletes at the Munich Olympics in 1972. There were also western based, communist affiliated terrorists such as the Red Brigades in Italy, and the Red Army in Japan. As the Cold War came to a close, and the Soviet Union faced increasing difficulty with Muslim fundamentalism, its support for terrorism waned. A fine little event. At this stage of the game, 2 Ops is not a big deal compared to the possibility of an instant win (by forcing your opponent to now play a card he had planned to hold to next turn). It is especially strong if your opponent does not have the China Card. Of course, you might hit a card you wish your opponent had held onto, but on balance, discarding cards from your opponent’s hand is a good thing. You could compromise and at least be careful about playing Terrorism when your opponent could have a scoring card favorable to you. Terrorism works best when you combine it with other hand-reducers like Five Year Plan, Grain Sales to Soviets, or Aldrich Ames Remix. Losing two cards is much more painful than losing one, since you can no longer hold a card even if you have the China Card, and moreover, you might have to skip your AR7 for lack of cards. Accordingly, as USSR, this is an outstanding event if Iranian Hostage Crisis has been played, one I almost always trigger. I tend to play this relatively early in the turn (often on the headline), before my opponent has gone to the Space Race, thus minimizing the chance that I force my opponent to discard a card he was going to hold or Space anyway. Terrorism can also be good as your last play if you suspect that the other side is up to something (especially against the US on Turn 10). Holding the China Card and playing SALT Negotiations are both decent counters to Terrorism by restoring your hand size. This entry was posted in Late War, Neutral Events and tagged Terrorism. Bookmark the permalink. I have a rules-clarification question. Imagine Terrorism played as an event by USSR after playing Aldrich Ames in the same round. How do you technically suggest to draw two cards without breaking the Aldrich Ames rule that till the end of the round (implicitly: constantly) all the US cards must remain revealed face up? 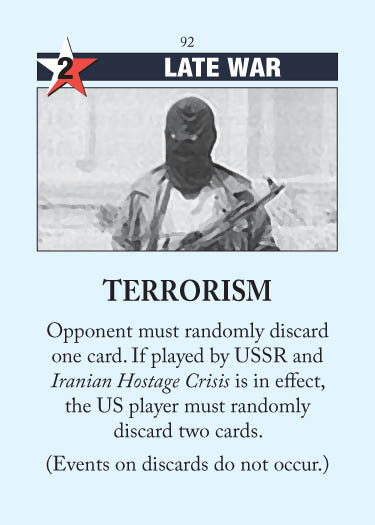 It has been suggested to me that the Iran Hostage card effect on the Terrorism card only lasts for the rest of the turn in which the Iran Hostage Crisis card was played. Why have a chit for IHC if that is the case? Because it’s not true: Iranian Hostage Crisis is underlined in red, indicating it’s a lasting effect. The best use of this card, IMO, is as USSR if you can force a double discard on turn 10 while holding China – this denies the US their AR7 play, and means that you get the last play of the game. Even if you don’t make them DEFCON suicide, it can still be extremely strong.